One Vanderbilt, as it will appear over Grand Central. Sometime in the next few years, a new landmark will muscle onto the skyline, hulking over the Chrysler Building and waving to the Empire State Building half a mile away. 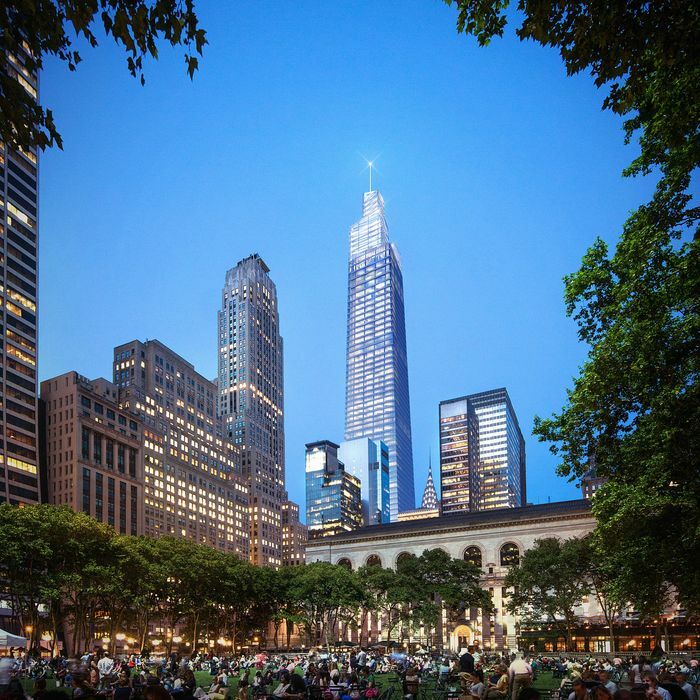 At 1,401 feet — more than a quarter-mile high —the skyscraper known as One Vanderbilt will have Grand Central Terminal as its ground-hugging neighbor; the vacant construction site has opened up a tantalizing but temporary view of the station’s western flank. When the new tower is completed, we’ll be able to pick it out from bridge crossings and airplanes and adjoining states, its four crystalline forms tapering off in turn like voices at the end of a round. We’ll note the lines of angled terra-cotta tiles banding the glass façade and giving the surface an expensively patterned texture. Depending on our dispositions, we’ll celebrate or bemoan Manhattan’s continuing vertical march. But despite this ostentatious new presence in the heavens — a new scepter just waiting to be shattered in the next alien-invasion movie — its most significant segment will be the lowest. The building gets its meaning at street level, where the people are and the architecture reaches its apex of complexity. Those first 100 feet show what the public can demand from a big corporate office tower: not just a machine for making money, but a juncture in the city’s life. 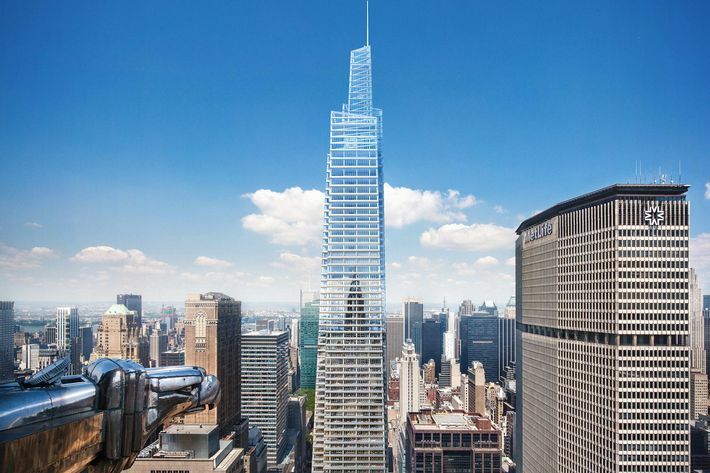 One Vanderbilt, designed by Kohn Pedersen Fox, is that rarity, a civic-minded Goliath. A ceiling clad with concave terra-cotta tiles tilts up from west to east, like a mouth opening to swallow Grand Central. Those who step inside can slip down the building’s gullet and into the transit system. The street outside, for years a dark forgotten alley, will become a pedestrian-only thoroughfare, adding to the area’s scarce stock of genuinely public space. Big towers assert themselves on the shared domain of the skyline, generally with minimal thought for the commonweal. They’re built by numbers: Architects figure out how many income-generating square feet they can eke out of a particular location while abiding by city rules, and developers see how much quality they can scrape away from the design without letting the cheapness show. The exceptions to these cut-rate high-rises are generally anorexic residential towers erected for a handful of owners who will pay preposterous premiums for height and views. They are the world’s most exclusive perks: ultra-luxury objects that benefit almost nobody while facing onto our streets and occupying our sky. One Vanderbilt needed a public buy-in from the start: a change in height and bulk restrictions to allow one of the city’s tallest buildings. Michael Bloomberg’s administration was happy to oblige. In the waning months of his tenure, Bloomberg tried to force through a sweeping rezoning plan that would not only have made this tower possible but also turned a vast swath of eastern midtown into fertile ground for new development. When that overreach failed, it looked for a while like the project was dead and the area around Grand Central would indefinitely remain a thronged but aging business district of low-ceilinged office buildings. Then the de Blasio administration revived a miniaturized version of the rezoning plan, tailored to let One Vanderbilt proceed. The cumulative result of all this stop-and-start negotiating was a sophisticated design and $220 million in street and transit improvements, to be paid for by the developer, SL Green. The neighborhood badly needs those ministrations, and the urgency will only increase. When the Long Island Rail Road arrives on the East Side (a blessed event not scheduled for another five years, at best), it will ship in as many as 75,000 new commuters per hour, doubling the station’s peak congestion. Those crowds would overwhelm Grand Central’s ramps and escalators, turning the flow of foot traffic between platform and sidewalk into a sclerotic sludge. Instead, many of those new arrivals will siphon off toward 43rd Street and wind up in the base of One Vanderbilt. This might seem like a function only a traffic engineer could love, but it roots the building in the city’s public life. It also makes the tower’s most important face the one that turns toward Grand Central. One option might have been to give the Beaux Arts monument a limestone companion, which would likely have matched the terminal’s weightiness but not its grace. Instead, the architects lifted the office floors above an open-faced train hall, a little sibling to the Main Concourse across the street. More than a century ago, Grand Central Terminal set the standard for the way a private enterprise could manage the daily flow of crowds and form a bond with the city that extended well beyond its property line. One Vanderbilt doesn’t match its neighbor in grandeur, but it’s got its eye on the right tradition.